Authorities raided yet another rubber plantation on Tuesday as part of a new dragnet to catch illegal loggers in eastern Cambodia, said Eng Hy, spokesman for the National Military Police. It was the latest operation by a task force unveiled by Prime Minister Hun Sen last week to stamp out the rampant illicit timber trade in the eastern provinces bordering Vietnam. Mr. Hy said members of the task force arrived at the Chinese-owned Tong Ming rubber plantation in Kratie province on Tuesday and began inspecting the company’s warehouse. “We saw hundreds of pieces of wood stockpiled in the warehouse, but we do not yet know how much wood is in the warehouse,” or whether any of it was illegally sourced,” he said. Companies that own rubber plantations or hold other economic land concessions (ELCs) are allowed to fell the trees on their properties, but are known to stray out of bounds and buy up timber of dubious provenance. 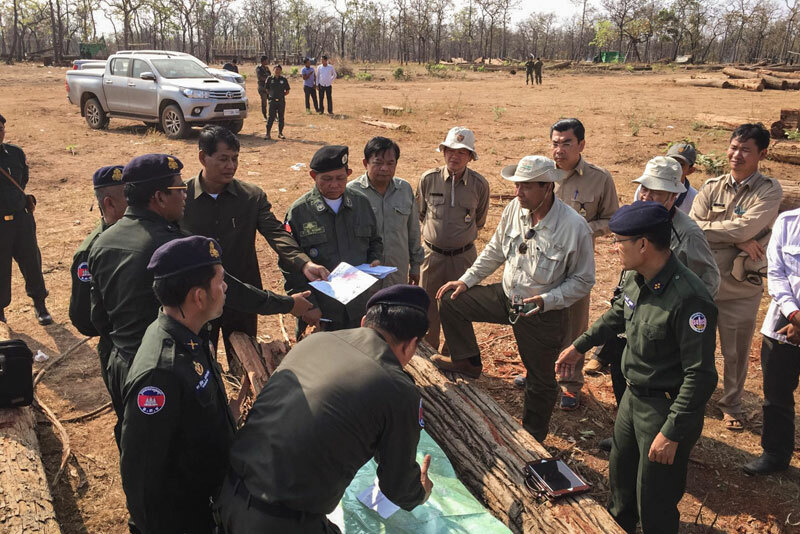 On Tuesday’s raid follows similar visits to ELCs and warehouses on Sunday, including the China Dynamic plantation, also in Kratie, and a depot owned by wealthy businessman Lim Bunna in neighboring Tbong Khmum province. Mr. Hy said the task force was also inspecting a large pile of wood found in the forest inside the Phnom Prich Wildlife Sanctuary in Mondolkiri province. The spokesman said he did not know whether the pile was on property belonging to any of the companies with ELCs inside the sanctuary. The sanctuary is home to the Dai Thanh concession, owned by Soeng Sam Ol, who along with Mr. Bunna is a prime target of the task force. Both men also hold the title of “oknha,” an official honorific secured with a minimum $100,000 donation to the state. Mr. Hy said the task force did not yet know whether any of the wood it had found so far was illegally sourced, but that it might have some answers by today. 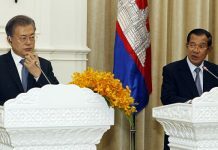 “We will compile a detailed report about the wood found in the three provinces and then we will send the report to Samdech Prime Minister Hun Sen,” he said. Mr. Sam Ol has denied the allegations of illegal logging. Mr. Bunna could not be reached for comment. The task force has made no mention of timber magnate Try Pheap, however, who has drawn more accusations of laundering illegally logged timber through his many ELCs than any other oknha in the country—by far. Asked about the selection of targets, Mr. Hy said Mr. Pheap would get his share of the task force’s attention. “The task force will do inspections not only of Try Pheap’s warehouses, but we will check all the companies that have received land concessions,” he said. During the first meeting of the task force in Phnom Penh on Monday, Mondolkiri provincial governor Eng Bunheang claimed that Mr. Pheap and Mr. Bunna were recently granted licenses for ELCs inside Phnom Prich by the Ministry of Environment. 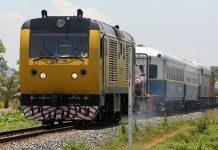 The licenses would violate a freeze on new ELC licenses that Mr. Hun Sen ordered in 2012. On Tuesday, Environment Ministry spokesman Sao Sopheap denied the governor’s claim. He said the two oknhas had only been given permission to collect already logged wood on two ELCs the ministry canceled last year. Mr. Sopheap said he did not know how much wood they were given permission to collect or how much they paid for the rights. 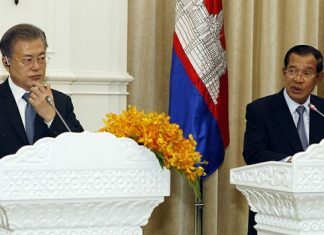 As part of its crackdown on illegal logging, the task force also ordered a temporary stop to all transport of timber from Cambodia to Vietnam, effective immediately. Much of that traffic is believed to be illegal. “We have stopped all legal and illegal export of wood overseas for the moment because our task force wants to find out the truth,” Mr. Hy said. The government has staged high-profile operations against the country’s widespread illegal logging trade several times before. But those efforts have always died away after a few months, having had little if any discernable impact, and leaving environmental rights groups wary of the government’s commitment. Reports and investigations over the years have implicated the government in the illegal logging trade at the highest levels. National Military Police Commander Sao Sokha, whom the prime minister put in charge of the new task force, has been accused by environmental watchdog Global Witness of playing a major role in the trade himself.